J.P. Morgan의 Quorum 블록체인 프로젝트팀과 프루프스위트(Korean ambassador of Quorum)가 주최하는 J.P. Morgan Quorum Blockchain Seoul Meetup이 개최됩니다. 4월 18일 목요일에 J.P. Morgan의 Quorum 블록체인 프로젝트팀과 프루프스위트(Korean ambassador of Quorum)가 주최하는 J.P. Morgan Quorum Blockchain Seoul Meetup이 개최됩니다. 이번 밋업에서는 Quorum 블록체인 프로젝트에 대한 소개와 활용 방법 및 사례 등을 발표할 예정이며, 프루프스위트의 핵심 기술자 분들 및 J.P.Morgan Quorum 팀의 기술자 분의 프레젠테이션이 준비되어 있습니다. 블록체인 관계자 및 기술경영 전문가 분들의 많은 관심 부탁드립니다. 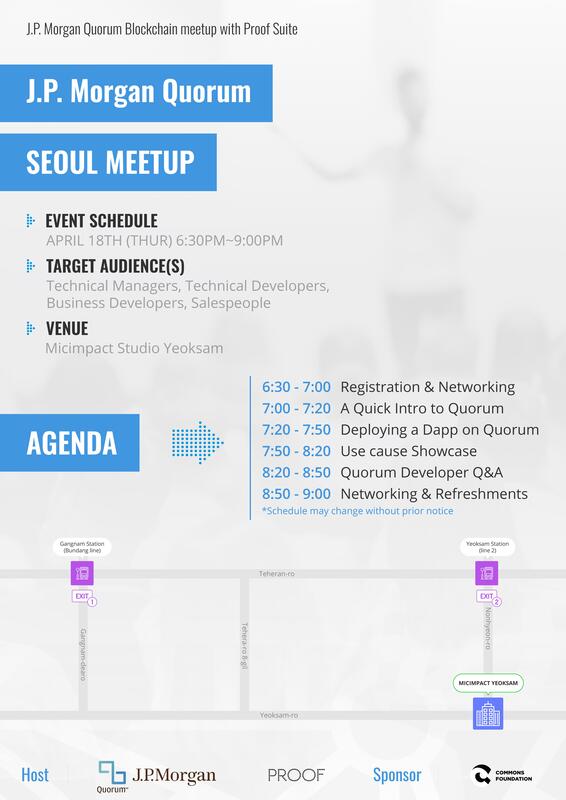 Coming next week on the 18th of April, the J.P. Morgan Quorum Meetup will be held in Seoul, Korea. 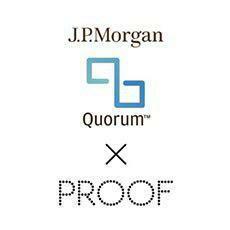 This is a semi-technical meetup which is hosted by Proof Suite, an official ambassador in Korea for the J.P. Morgan Quorum team. In this meetup, the focus will be on introducing Quorum and describing the current state of the project, showing use-cases, etc. Presentations by the core engineers from Proof Suite and J.P.Morgan Quorum team is also scheduled! This meetup is suitable for technical managers, technical developers, business developers, and those in sales.